Having impressed as Shane Byrne’s stand-in for three-quarters of the 2018 BSB season with PBM Ducati, Honda Racing signed up Andrew Irwin for their revised team ahead of the 2019 championship. The Northern Irishman forms a handy-looking yet fairly inexperienced (at BSB level) partnership with top independent rider in last year’s World Championship, Xavi Fores. BS: Andrew, here we are at Monteblanco at the start of your Honda journey but how did it come about? AW: It was probably about September time I got in contact with Harv (Havier Beltran, Team Manager - Honda Racing), on the Thursday of Silverstone and I gave him call and he said, “oh yeah, we’d be interested”. To be honest, the deal came about pretty fast and while I didn’t sign a contract for a while but I knew everything was in place. Growing up as a kid, watching Kiyonari, Crutchlow, even when Haslam was with Honda, all the top riders have been there. And what I say is that with Alex Lowes and Jonathan (Rea) doing a good job in World Superbikes, and they’ve all ridden for Harv and Honda UK. So as soon as I knew the deal was there I got really excited about it. It’s the biggest manufacturer in the world and it’s the one we all want to be involved with. It definitely didn’t take me long to say yes! Did you get any insight into how the bike would be developed for this year? I was aware there would be changes made in the team, not with staff because I feel the staff are really good; my crew chief, Spyder, he’s a really good guy, and Darren Maisy, so I have two really good mechanics and everybody works in a really good way but I knew that they want to show that the Fireblade is competitive and I think after pre-season testing, with the changes they’ve made, it’s shown that everybody is taking it serious, we’re going to have fun and it should be a good year. Your new team-mate, Xavi Fores, comes with World Championship experience but limited knowledge of British tracks, have you been teaching him about Cadwell’s mountain and Thruxton, etc.? In testing it’s slightly different, coming here to Monteblanco was new when we came here in December but Xavi has a lot of experience of Portimao. He has knows what he wants from a bike, and what I know is that I always want to go fast but he knows how to make the bike faster. So, with my youthfulness and Xavi’s experience we make a good team. And also with Tom on the Stock 1000, the atmosphere we have inside Honda is so fun. Like I said, it’s serious but we’re enjoying it. We’re all happy, everyone’s smiling and there’s no doom and gloom. We all want to put the Honda’s back to where they should be and I think together we can all do that. For me, the goal is to make the showdown, that’s where I want to be. We all know the bike is more than capable of doing that, the team is more than good enough and together we’ll do a good job. Speaking of smiles and team spirit, you’ve tested here at Monteblanco and Portimao, and so far, so good. Obviously whatever the new components on the bike are, they’re working, you guys have been consistently top 10, how pleased are you so far? Yeah, it’s my first full season on a superbike as well, I think some people forget that. When you ride a 600, it’s just the suspension you can change and a small bit of the electronics but with the superbike you’re changing the angle, pivot points, you can turn a superbike upside down and still ride it! It’s so different, it’s been a lot of learning but I like it and I’ve been trying to take as much of it in as possible. The last day at Portimao I took so much in than the five days previous and sometimes you know when to stop and we just did the half day, so I finished 4 ½ days of testing with no crashes, no silly mistakes and that gives me confidence when we go to the Silverstone test so hopefully we can take another step forward and keep improving the bike. We know that when we get to the UK the temperature isn’t going to be as warm as what we’ve had but with the BSB testing ban we’re coming to Spain where the weather is a lot better. So, when we go to Silverstone the track temperature is not going to be as warm which should suit the Honda. Generally, when there’s not as much track temperature there’s more grip and that should suit us. What are you looking forward to this season – tracks, competitors, family rivalry?! Obviously I have Glenn and a lot of people ask me about it, and while it’s nice to beat your brother it’s also nice to see him doing good. I’m just looking forward to the challenge ahead, I believe we can do a good job, I believe I’m in a good place and I feel healthy. There’s not one track that stands out for me, I’m just love racing motorbikes and that’s when I’m happiest. At the minute, I’m in a really good place. Everything I’m doing, I’m smiling while I’m doing it, it’s not like work. This is what I love doing, this is what I’ve always wanted to do from no age. I want to keep that dream going, keep achieving, keep growing as a person and as a rider, and try to get to the top. Away from the circuit, how’s your pre-season training going? I’ve been living in San Javier with Glenn, which is about 45 minutes from Alicante. So I’ve done all my pre-season training over here. We have a personal trainer, this guy called Peter from ClubFit, an awesome trainer. We’ve done a lot of cycling and this 8-day motocross camp with some guys from the Isle of Man, who I didn’t know before I went but it brilliant craic! They’re all pretty good on motocross bikes and it got pretty competitive and we all did proper length moto’s. If some people think I’m lose on a short circuit bike then they should see me on a motocross bike – I’m the definition of lose! I love doing it, it builds your stamina, it builds everything, I don’t think there’s any better any of training than riding motocross because it’s so physical. I did it loads when I was a kid and I haven’t done it so much recently but Honda gave me a nice shiny 450 so I’ve been making the most of that. 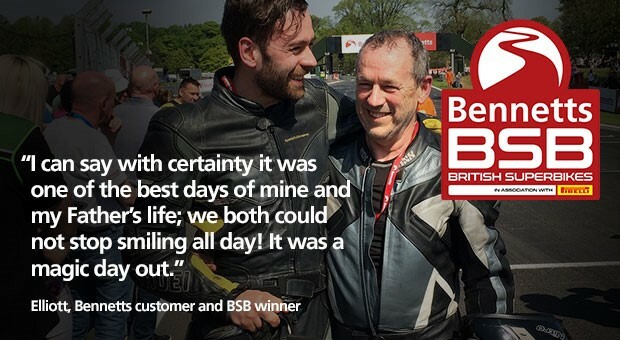 The 2019 Bennetts British Superbike championship gets underway on 19-21 April at Silverstone but first there’s an open day at Silverstone for the final test ahead of the season on Tuesday 9th April.